Please note: pictures below are examples of our various units. Individual unit looks and locations may vary. Click photo to enlarge. Centrally located along Schooner Trail these units sleep up to 6 people with one queen bed, a single bunk bed, and a full size futon in the living area. They have a full bathroom, kitchen table seating for 4 people, a covered porch, and charcoal grill. 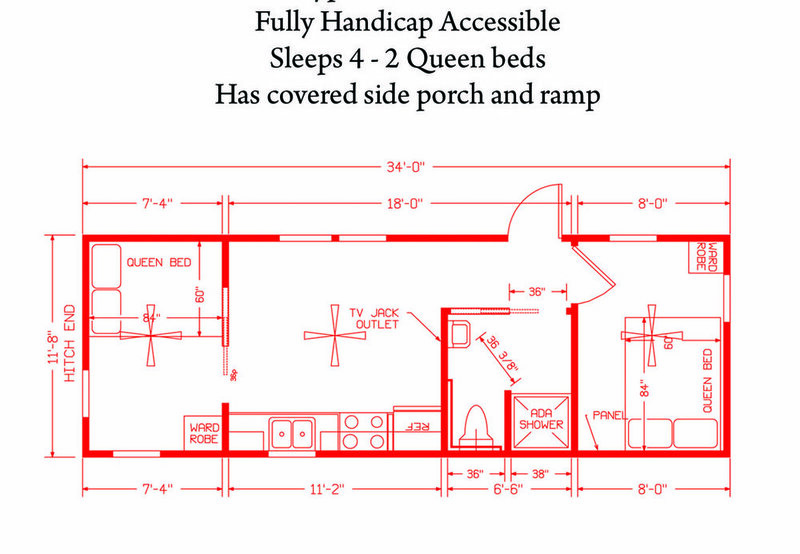 We have some handicap accessible cabins that sleep 4 with two queen beds. They have a full bathroom, kitchen table seating for 2 people, a covered porch, and charcoal grill. 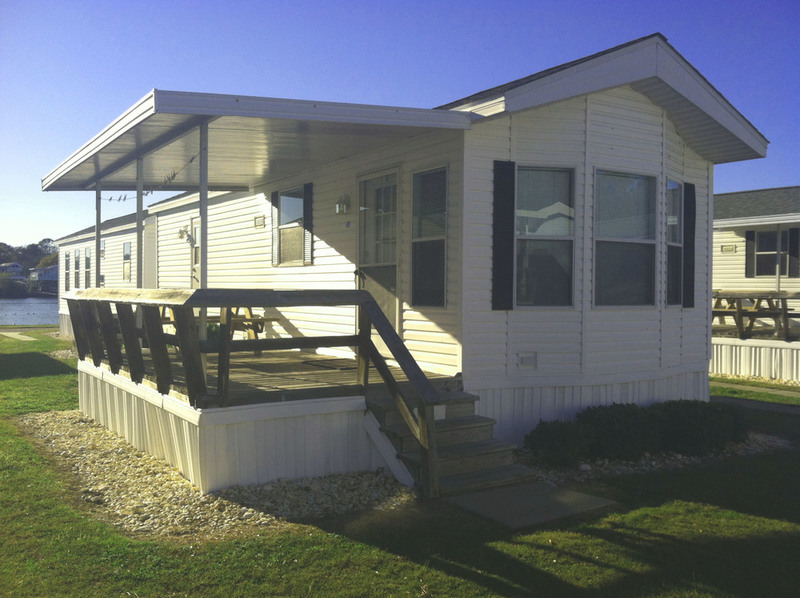 The 2 bedroom 1 bath unit will sleep up to 5 people, most comfortable for 2 adults and 3 children or less. 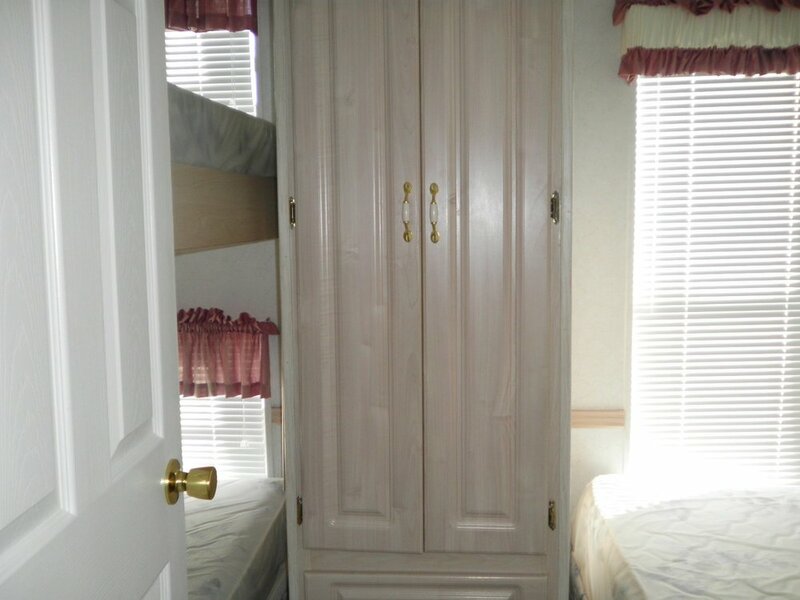 The units have one double bed and three singles (one bunk, one single). These units are 396 square feet. Some units are located along the lakeside road. 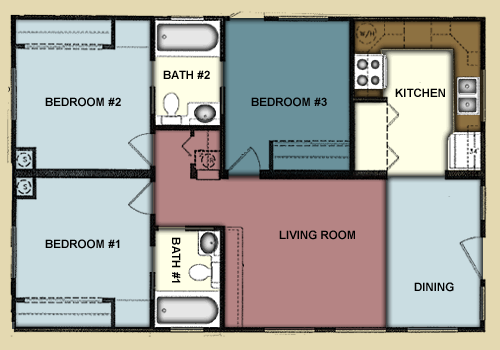 The 3 bedroom 1 bath unit will sleep up to 6 people, most comfortable for up to 4 adults, 2 children or less. The units have two double beds and two singles (one small bunk). The bath has a stand up shower (no tub). 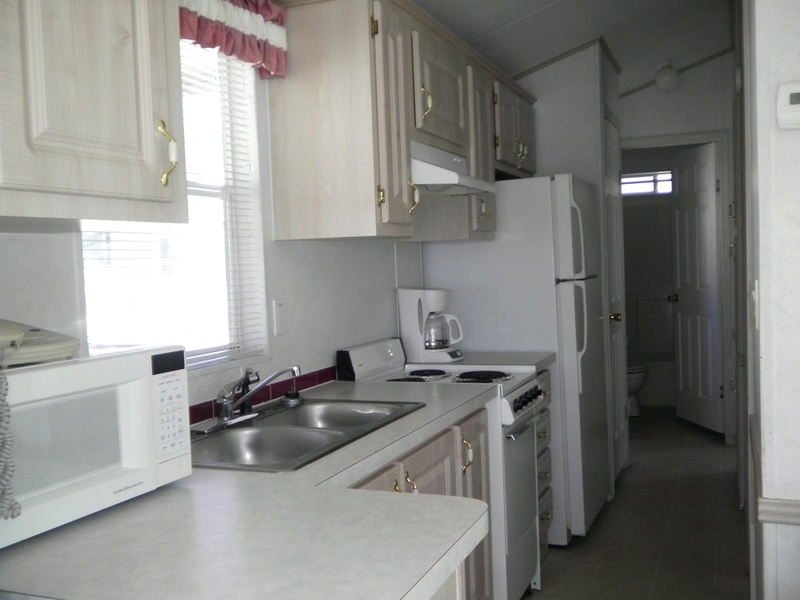 These units are 396 square feet. The executive unit has 3 bedrooms and 2 baths. 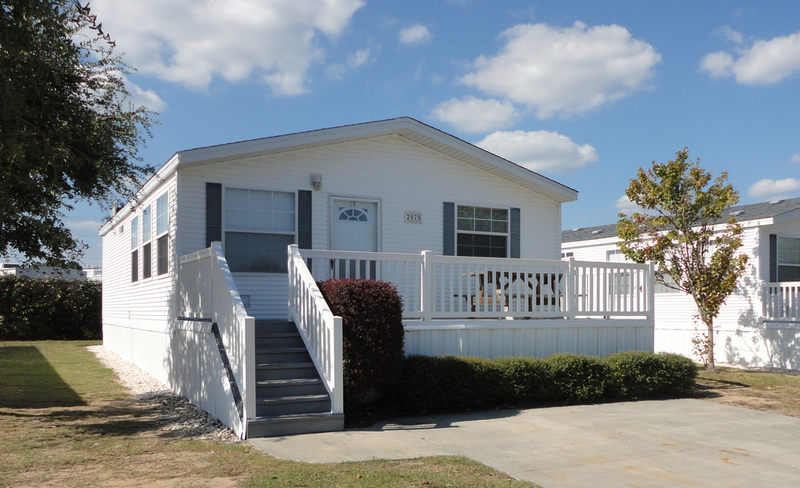 This is the best choice for a family of all adults and will accommodate up to 8 people. The units have two queen beds and two twin beds (unless otherwise noted as having 3 queens) and queen sleeper sofa in the living room. These units are 816 square feet. Singlewides have a 19 gallon water heater. 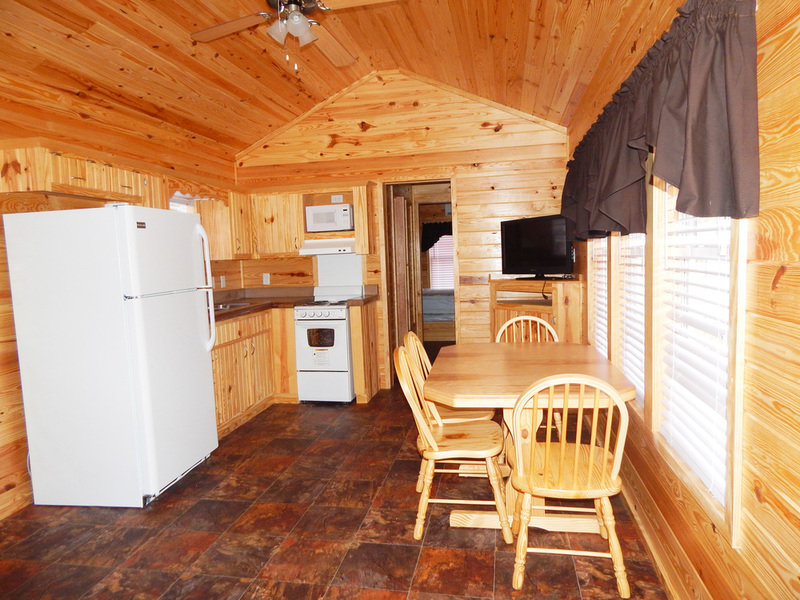 Cabins and Doublewides have 30 gallon water heater. These are MUCH smaller than standard home units. 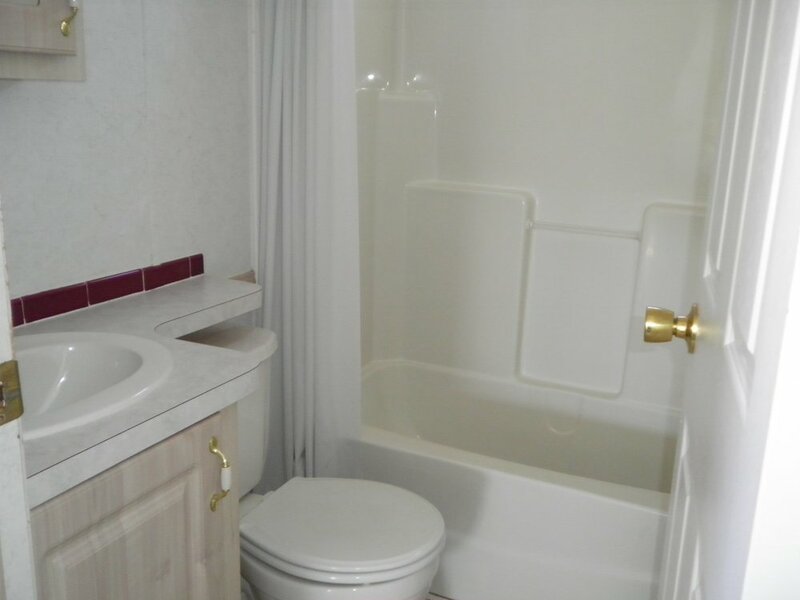 We have bathhouses with showers available throughout the campground as well. Looking for some upgrades? 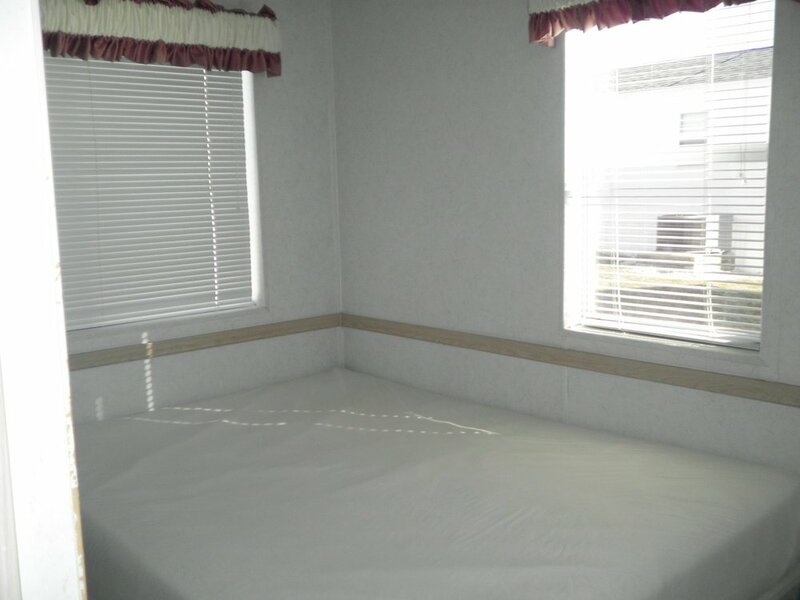 We also have some Executive doublewide units that come with linens and many extras! These units are called First Mates and Captains Quarters. They will sleep up to 6 adults. Rental reservations made over the phone require a refundable security deposit. There is no daily housekeeping/maid service. Guests must leave unit clean and undamaged to receive the security deposit refund. Security deposits are as follows: $100 per week for singlewide, $200 per week for executive doublewide, and $300 for First Mates/Captain's Quarters. Reservations made online require full payment at the time of booking. Please call to make other arrangements. Payment in full for the total amount of the stay is required 30 days prior to arrival. Reservations made within 30 days of arrival are required to be paid in full at the time of booking. We accept Visa, MasterCard, American Express, and Discover . Cancelling requires a 30 day notice prior to arrival and will result in a $25 administrative fee. Cancelling within 30 days of arrival will result in the forfeiture of all monies paid. Refund minus applicable fees will be credited back to the credit card the reservation was paid with. If reservation was paid with cash or check, a check will be mailed to the address on the reservation within 14 days of cancelling, unless the check was received less than 30 days from the date the reservation was cancelled, in which case it could take up to 45 days to receive a refund check. We WILL NOT issue a refund to a different credit card. Check-in time is 4pm. Entrance to the park is not allowed until rental is ready for check-in so please plan accordingly. Check-out is 11am and guests must depart the campground upon check-out. All units are non-smoking. Generally pets are NOT allowed in the Vacation Rentals. We do have some rentals that may be dog friendly with prior arrangement based on availability. There is a non-refundable fee of $15 per night, per dog; maximum of two. Pet counts toward total number of occupants and cannot exceed maximum. Other limitations may apply at our discretion. Please see the campground pet policy on the Yeas & Nays page.